Over the past decade, one important composer has at last emerged strongly from the shadows of an often disturbing past: Erich Wolfgang Korngold. Few could guess that his violin concerto would become one of the mainstays of the repertoire when it was dismissed by the entire music establishment upon its premiere in 1947. His Symphony in F sharp was even more divisive, with many of Korngold’s closest friends and colleagues refusing to associate themselves with him or the work. Even today, many critics and musicians may raise a sceptical eyebrow at the mention of his name, or the suggestion of mounting one of his operas. As recently as 2008, one prominent journalist wrote in the conservative weekly magazine ‘The Spectator’ that following a concert performance of Korngold’s opera ‘Das Wunder der Heliane’, it was possible to understand what the Third Reich meant by ‘Degenerate Music’. Another prominent critic writing for the conservative ‘Daily Telegraph’ reported that he had to lock himself into a darkened room for three hours in order to recover. Korngold’s music clearly elicits strong emotions – most often from the musically conservative or from the self-proclaimed arbiters of musical decorum. That being said any contemporary visitor to the cinema who hears a score by John Williams must realise how unthinkable 20th century music would be without Korngold’s influence. It is here, that we arrive at the crux of the dilemma: Korngold composed in a late-Romantic idiom at a time when the world was gazing into the countenance of near annihilation. In the opinion of more sober colleagues, the Zeitgeist called for the abandonment of the comfort zone of tonality. Some, such as Schoenberg, even felt that the musical language of the previous century, representing establishment, stability, and self-satisfaction, had bankrupted itself. Only a new relationship with music’s fundamental elements could inject life into its now deflated existence. Korngold, both in his background and singular personality, rejected this analysis. He was abundantly gifted and precocious- to a degree that frequently left his more experimental and inquisitive contemporaries behind. Colleagues who took the high-minded route of ‘originality’, in preference to tonal convention, found it easy to accuse Korngold of opting for the ‘lazy’ path of least resistance. For them, it was inconceivable that music could ever move ‘forward’ while tethered to the existing relationships between listener and composer. For experimenters, music needed abrasiveness in order to challenge, threaten and galvanise. An age in which mass murderers had become national leaders demanded that art be aggressively provocative. Korngold remained a child of his time, and his opera, ‘Das Wunder der Heliane’, can be understood as a powerful metaphor for light shining through a land of savagery. Korngold was also a victim of his time. As a naturally gifted composer who wrote music that avoided the abrasive, atonal experimentation of the day, he would have to deal with accusations of ‘juvenile triviality’ for nearly his entire professional life. Colleagues of his who had begun their careers as composers of ‘serious’ music often found that writing hit-songs and operetta was the only remaining outlet for their tastes and talent. Korngold himself would establish a parallel existence adapting and updating operettas for mass audiences. Yet within Korngold’s creative energy there was a thriving musical vision that demanded both a voice which was contemporary, yet exhilarating. His gifts for melody and harmony were obvious, and he was not always prepared to subject his listeners to the alarming state of the world they inhabited and the horrors that they were soon to face. Like many great works, ‘Das Wunder der Heliane’ would be unintentionally prophetic. With so many of his colleagues either abandoning serious music or abandoning tonality, to remain true to one’s inner musical voice was the bravest of all options. Condemning the body of Korngold’s work based on his relatively short period in Hollywood would be a grave injustice. It would be a misunderstanding of both the nature of Korngold’s inner voice and the nature of Hollywood in the 1930s and 1940s. In ‘Das Wunder der Heliane’, premiered in 1927, Korngold used cinematic elements that would eventually come to define the ‘Hollywood Sound’. Yet these devices, such as angelic off-stage choruses; sweeping cascades of harps and celestas or the deafening crescendo of pealing bells would rarely, if ever, make an explicit appearance into an actual film score of Korngold. ‘Heliane’ came years before Korngold’s start as a film composer and therefore coincided with the first successful fusion of sound with image. When ‘Heliane’ was composed, music for cinema consisted of recycling and adapting popular classics. The idea that the musical world Korngold created for ‘Heliane’ would become the sound of Hollywood would have seemed incomprehensibly abstract in 1927. As Korngold’s music came to define the sound of Hollywood, it became far too easy to dismiss all of Korngold’s output as ‘Hollywood’ – an implication that was meant to cheapen both Korngold and Hollywood at the same time. Cinema and its use of music, or its equally creative and frequent non-use of music, have now grown well beyond the restrictive populist confines of its earliest days. Today, only the most rarefied musical snobs would condemn a composer who writes music for the many new media platforms available. Korngold’s turn to the new-media of sound-cinema should be judged in a similar context. It is, however, impossible to detail Korngold’s output without taking into account the historic turbulence that catapulted him into his 12-year existence at Warner Brothers. The expulsion, persecution and murder of composers and musicians who were incompatible with the draconian ‘race’ laws of Hitler’s dictatorship forced most into undertaking existential rather than artistic survival strategies. Composing for film in pre-Hitler Europe was a legitimate area of musical experimentation. Prominent avant-garde composers landed in Hollywood based on their often scant dalliances with film and music in such new-music festivals as Baden-Baden in 1928. The first original Hollywood film score was composed by the Viennese Max Steiner in 1933 for ‘King Kong’. 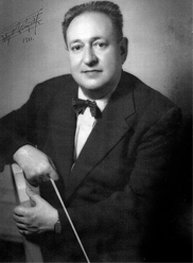 Film music was still developing, and it was consistent with this developmental phase that Korngold came to Hollywood initially as an arranger. His arrival in Hollywood must be seen in the context of other cinema composers who were coming out of Vaudeville as former bandleaders, or music-arrangers for silent films. None came with Korngold’s legacy of performances by Europe’s great orchestras and the endorsements of Gustav Mahler, Artur Nikitsch or Richard Strauss. To the existing musical establishment in Hollywood, it looked as if a sledgehammer had been brought in to crack a nut. Korngold’s innate skill and personality, however, were able to create a team that brought film scoring up to the same standards of modern film-production technology. His ability to orchestrate, play the piano, conduct and calculate mentally the length of music needed for any pre-determined timeframe placed him well above the abilities of his colleagues. It saved both money and time, and contributed enormously to the profitability of the studios. It also soon became apparent that a strong score could mask weaknesses within other aspects of the production. Korngold’s studio work consisted of just some sixteen dedicated soundtracks composed between 1935 and 1947. By comparison, his colleague Max Steiner would dash off a dozen or so within a single year. Korngold’s contractual fee with Warner Brothers was $12,000 per movie. Even when multiplying this sum by a factor of 15 in order to come close to today’s values it would be inadequate to cover the flamboyant Hollywood lifestyle detractors accused him of leading. As he composed only slightly more than one film-score per year and supported an extended refugee family, the income could hardly be seen as compensation for his losses in Austria, where he owned both an Alpine estate near Salzburg and a Villa in Vienna’s most expensive residential district. The disparaging commentary from former colleagues, both those who remained in Austria and fellow émigrés in the United States, who alleged that he defected to Hollywood in order ‘to get rich’ was very far from reality. Korngold lived from 1897 – 1957, which places his dozen or so years with Warner Brothers into perspective. By the end of this period, a number of other factors had dulled his initial optimism for the new medium. It was difficult for even the most naturally gifted composer to create on demand. In this respect, Korngold had it easier than many of his less illustrious colleagues, confined to the lower ranks with endless orchestrations and in-fill links using pre-existing material already written by someone else. Korngold never had to work on the musical production line that wore down the spirits of many of his fellow émigrés. That music was being used to compensate for other weaknesses was already accepted, but Korngold became increasingly aware that films were diminishing in social and intellectual value. The cheapening of Hollywood’s output from the mid-1940s onwards would have a detrimental effect on his music and on his creative energies. The end of the war in Europe combined with the reality of the day-to-day existence far from home in America caused enormous emotional stress, and in common with Ernst Toch and Erich Zeisl, Korngold suffered a debilitating, though non-fatal heart attack. It was a warning shot that followed his departure from the studios and kept him from an immediate return to Europe. What awaited Korngold upon his return to Austria would eventually result in far greater creative debilitation. He was met with a combination of incomprehension, jealousy and contempt. He was accused of living out the war in luxury while others suffered the horrors of Hitler and defeat; he had sold out his natural gifts to the gods of money and the tawdriness of Hollywood; and even with his departure from Warner Brothers, he stubbornly refused to conform to the dictates of the Zeitgeist. His post-war compositions were dismissed when the slightest snippets of film music were quoted either directly or indirectly, yet his film music had often been elevated when he incorporated quotes from his earlier concert works or operas. Some of his cinematic themes and motifs can even be found amongst his earliest sketches. Upon his return from Europe, Korngold retreated into an inner world of reassuring nostalgia, with his last dramatic work carrying the unintentionally symbolic title ‘The Silent Serenade’. Before the opprobrium of Korngold’s enforced refuge in Hollywood, he was arguably one of new music’s bravest voices. In the noisy world of musical Modernism that emerged after the First World War, Korngold pursued neither anti-diatonic elitism, nor the abandonment of serious music altogether in order to compose his best loved works. Korngold maintained a style that was appealing without being populist, yet demanding without being esoteric. Unlike Kurt Weill, Wilhelm Grosz, Werner Richard Heymann, Friedrich Holländer or Mischa Spoliansky, he did not pen a single ‘hit’ song prior to his departure to Hollywood. Though many of his works could be abrasive, he never abandoned tonality in an attempt to reach the more rarefied zones of a yet unknown musical region. This was a position that was unique amongst composers born within the first half-decade of the 20th century. His most popular works kept their place in opera houses and concert halls at the same time that his chamber works would be performed by the Schoenbergian Kolisch Quartet during the International Society for Contemporary Music’s festival in Venice in 1924. During the course of the 1920’s, the two sides of the musical debate would become more fractious and antagonistic. Korngold was very much the figurehead for the organic continuation of music along its historic diatonic path. His slightly older colleague and friend Hans Gál could have been speaking for Korngold when he explained that tonality was as firmly set within his musical language as the laws of gravity: “I am told that people can exist freed from the laws of gravity, but for myself, I cannot imagine it.” By the time Hitler’s followers had muzzled the music they regarded as ‘degenerate’, artistic poles had indeed become extreme. If Korngold’s last European opera ‘Die Kathrin’ sounds populist and gratuitously appealing, one needs to see it in the context of the extremes of Jaromir Weinberger’s enormously successful ‘Schwanda the Bagpiper’ and Ernst Krenek’s abrasive 12-tone opera ‘Charles V’. Schoenberg maintained that the most important thing a composer can do is to listen to his inner voice. Few composers followed this instruction with greater perseverance than Korngold. The price he paid was high, and only today can we recognise that the cost was not carried by him, but by a public who for years were demeaned for responding to works that spoke so resoundingly to their inner needs. Die tote Stadt Op. 12 will be performed in the Bayerische Staatsoper in November 2019. Besetzung: 3 (3. auch Picc.) · 2 · 2 · 2 – 4 · 2 · 3 · 0 – P. S. (Trgl. · Beck. · Tamt. · Schellentr. · kl. Tr. · gr. Tr. · Xyl. · Glsp.) (3 Spieler) – Hfe. – Str.